physically hot (although 104F is the *average* daily temperature in July). 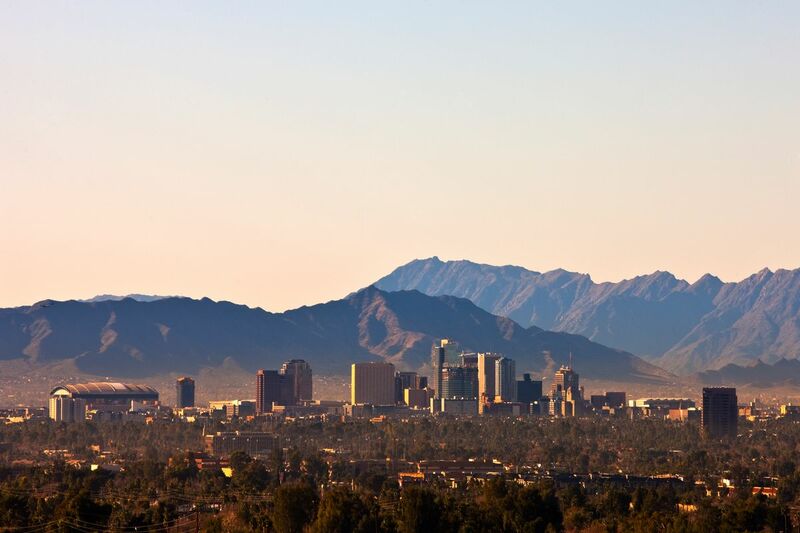 To see why you should think of Phoenix as more than a sprawling mega-city (the fifth largest in the nation), try starting your day on horseback, moseying up Camelback Mountain. Or take a daybreak hot-air balloon ride, gliding over the Sonoran Desert. Visit a 1500-year-old Native American village (the Pueblo Grande Museum) in the afternoon and end your day either dining on fusion cuisine based on Pima Indian traditions (think buffalo in saguaro blossom syrup and roasted maize cheesecake) or two-stepping in Scottsdale. The next day, catch one of Phoenix's many professional sports teams or relax with a nopales cactus wrap (much more comfortable than it sounds) or a round of golf at one of dozens of spas and resorts surrounding the city, and you will have forgotten all about the traffic. digits, but the winters cool off and provide perfect weather for picnics and hiking under clear blue skies. Keep in mind that many a snowbird stumbles south during this time, so you will need to book hotels early. Temperatures quickly rise in the spring, but this can be a good time to snag a good resort deal.